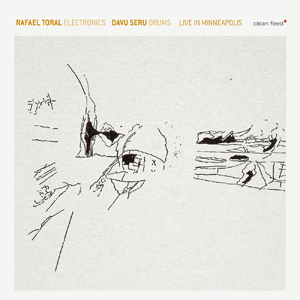 Portuguese experimental musician Rafael Toral has spent the last half-decade pursuing a focused aesthetic endeavor that he calls the Space Program. It’s music born of refusal. Toral is a former master sculptor of guitar drones who retired at the top of his game. When he stopped, he not only gave up the safety net of continuous sound, he rejected certain common shortcuts and shortfalls of contemporary electronic improvisation; no loops, no samples, and no sitting behind a screen. Put simply, he uses self-devised and highly customized electronic devises that must be played, not triggered, to improvise against a backdrop of unforgiving, all-revealing silence. If you have followed Toral, you already know all that, and you also know that every album he’s made since 2006 has been part of a planned, comprehensive program that will demonstrate how his instruments and ideas work on their own and in exchanges with other musicians. Live In Minneapolis is the first record he’s made since the project began to not have the word space in its title; he wasn’t planning on this one. Even so, its music would fit right in on Space Elements, the three-volume series of records that catalog Toral’s Space-time encounters with other musicians. But if he had included it in that series, we’d only have gotten a small excerpt, and apparently Toral thought enough of this encounter with Twin Cities percussionist Davu Seru to issue the whole thing. I can see why. Seru, who has also worked with Milo Fine, Paul Metzger, and George Cartwright, has a vocabulary that comes out of a free jazz lineage — there are moments when his playing reminds me of Milford Graves, Rashied Ali, and Whit Dickey. But he has great instincts for when to push, when to be silent, and how this music should be shaped. This enables Toral to function like a horn player, drawing that proverbial line and following it, without betraying the voltage-based essence of his instruments. A mere excerpt wouldn’t convey the way this performance builds, mutates, and flares into incandescence; they were right to release the whole thing.